Yeah, I know I am a bit earlier with my recap than usual. The reason is outside is so hot, and not like I can take a walk, or spent time outside with friends. So instead I am here, so bored, and decided to use my free time more productive, by writing my recap, of course! Here it goes. On Monday, Stardoll released new collection in Epiphany jewelery store. The items seem to have a boho theme, with feathers. fringes and tassels. The 'LOVE' necklace seems nice and is my favorite item from the collection. Unfortunately, items go to our beauty parlors. Nothing unusual though, as all Epiphany jewelry goes to beauty parlor. And I wouldn't have problem with that if it could go behind our 'ordinary' or Tress Up hairstyles. And bracelets and rings can be kinda inconvenient, as they go over your clothes. Still, a nice, unusual collection, worth investing some stardollars in it. On Wednesday - yeah, Callie is definitely back, awesome! - of course, new Callie's Picks collection, named 'Beach Party'. The collection, as the name says, consists of many swimsuits and summer clothes, perfect for this time of a year (for some, of course). There is a variety of clothes, fabrics, patterns. Some really nice pieces, like those silver jeans which were a part of offer, and I hated myself for not getting them back them. There is also a gorgeous ELLE oversized tee, which I love. Some other 'light' clothes swimsuits, along with the infamous Wang skirt. Anyway, pleasant, summery collection, I am sure each can find some pieces they like. And on Friday, we got new, time limited, Subcouture collection. Well, that wraps..wait, there are few other things I wanted to discuss, but not include in recap and poll. - Bailmain Tribute leaving the plaza. Yeah, unfortunately, Tribute season is over, so better grab some stuff so you won't to pay much higher prices in bazaar. 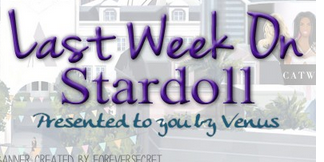 - A survey Stardoll sent us. They asked us 4 questions. Beside some basic question, about our age and the time we spend on Stardoll, they asked what updates we wanted to see. I guess Stardoll is taking their game seriously, and I love that they asked users for input on what we want updated. I asked for closet search function, which I guess 90% of users want. But if I had a chance to add some other suggestions, they would be increased maximum of items you can have at bazaar at the time, starcoin to stardollar conversion, or sell starcoin items for stardollars. And yeah, those pesky doors removed from our rooms. I am sure I can think of more, but not at the moment. What about you? That is definitely it. Now I hope you enjoyed reading my post, and I hope you will vote and comment on it. Until next Sunday.